There will be a lot less laughter in the world following the loss of Nancy Jane McMasters-Aguirre of Vancouver, WA who died at her home on October 16, 2010. Nancy, 68, passed surrounded by her love, laughter and her family; her favorite things. Nancy was born in Fresno, CA in 1941 to Daniel Festner and Tommie Jean Haynes-Festner. Upon her young mother\'s tragic death in 1951, Nancy, along with four of her five siblings, was adopted by her maternal grandmother, Mabel Sasser-Norton and Mabel\'s husband, William Norton. The children were moved north to the family farm in Farmington, WA. A young bride in 1959, Nancy married Russell McMasters of Garfield, WA and together they produced four sons and instilled in each of them a good work ethic and sense of humor. Upon their divorce in 1970, Nancy worked her way up the ranks in Washington\'s Department of Social & Health Services. Throughout her 35+ year career with DSHS, Nancy maintained her commitment to the clients she served\" (thanks for that quote, Lisa). After being raised in the Palouse, Nancy lived in the Lewis-Clark Valley until moving to White Salmon, WA in 1980. She loved the beauty of the Columbia River Gorge and truly appreciated the climate of Western Washington. She had lived in Vancouver, WA for the past 14 years. 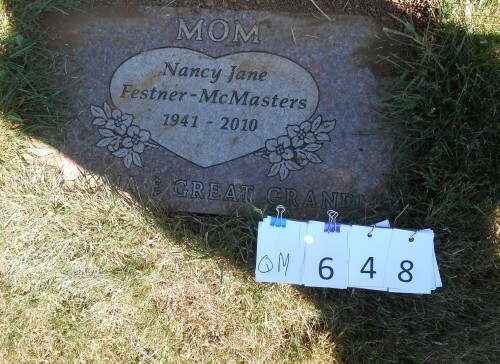 Nancy is preceded in death by many loved ones including her son, Steven McMasters. She is survived by her sons Keith McMasters, his wife Mira, Randall McMasters and his wife Cheyenne, and Bradley McMasters and his partner Brian. She is survived by grandchildren Montanna McMasters, Devin McMasters, Katie McMasters and great-granddaughter, Emily McMasters. She also leaves behind her younger brothers Timothy, Twain & Christopher Norton. Per Nancy\'s request, there was no service, though family members informally gathered to laugh, cry and hug (some drank). She was laid to rest wearing a nightgown and wrapped in her favorite down comforter in a green burial at Fern Prairie Cemetery in Camas, WA. Arrangements were thoughtfully and respectfully made through Straub\'s Funeral Home in Camas. Thank you, Chris. Condolences to the family can be made by signing the online guestbook at www.straubsfuneralhome.com or, better yet, kind thoughts can simply be sent, telepathically, directly to Nancy.